Jenn is mother to Logan, 17, and Jake, 13. Former police officer and private investigator, she now makes people happy with pie! Amy is a social media consultant, relationship builder, videographer, and trainer for Indrani’s Light Foundation, a non-profit with a mission to end gender-based violence. She relishes her new life of promoting businesses, engaging audiences and bringing joy to those she serves. Amy has a special passion for those who have suffered bankruptcy and truly understands the trauma such loss creates. 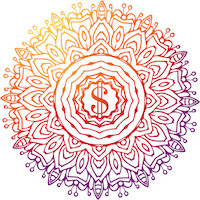 Sacred Money Studios aligns with her desire to create an environment of joy and love for all members of our community who desire to heal and grow their relationship with money. Amy is married to Luna, and has a bonus son, Hunter. Luna lives to pass her knowledge on to those that need it by helping them step out of their own limiting beliefs and boosting their sense of self-worth to imagine a world that is plentiful and supportive. She does this by bringing people face to face with money, taking the financial conversation offline and into a blossoming community where healing and thriving can take place. She is the mother of Hunter, 20, and married to Amy. The vision for Sacred Money Studios came to Luna Jaffe in June of 2015 as she prepared for a vision quest in Eastern Oregon. She was guided to create a retail space where all people, at all levels of income and net worth, could learn about money in a safe and embracing environment. Luna co-founded the business with her wife, Amy, and their dear friend, Jennifer in the fall of 2015, and immediately began the extensive renovation of their store. They opened their doors May 1, 2016, welcoming the community to gather, teach and learn in the space. Combining financial education with a pie shop and art gallery made complete sense - what better way to learn than to be surrounded by beauty and delicious food? Sacred Money Studios is a registered Benefit Company and has a deep commitment to inclusion, sustainability and a triple bottom line.